This by far was the hardest item to install, and the most frustrating. Chalk it up to inexperience. But the next one will be better! As I mentioned in my page on the front & rear glass, I wanted to do this right. Hence I removed the glass. The old non-original black headliner, from what I could tell, had been professionally and correctly installed. Matching that quality would prove to be a challenge. First thing to do is remove the old headliner. Here the visors and rear view mirror have been removed, and the front is cut about 1.5" from the windshield. A razor makes quick work of this. Looking closely you can see the roof insulation and the original factory overspray of parchment when the car was assembled. Note also the parchment where the A-pillar was covered by the headliner. Here the back of the headliner is cut and hanging. This was followed by cutting the sides to access the bows. 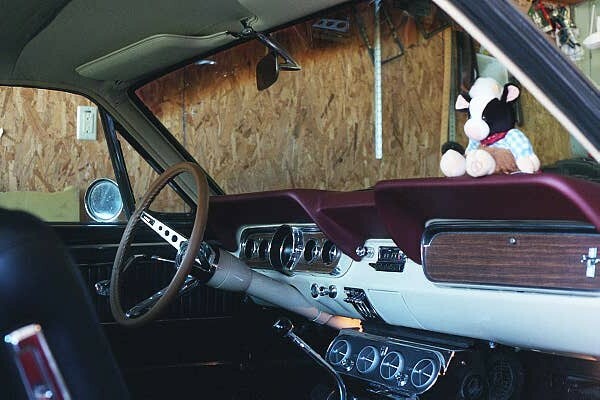 In a fastback, there are three bows in the headliner and as the end of each became accessible, they were numbered and the holes they were installed in were marked. After that, the windshield, rear backlite, old windlace, and remains of the headliner were removed. Mounting screws for trim, visors, etc., were partially reinstalled. This shot shows the new windlace in place. The upper rear trim couldn't be installed until the headliner was in place. The previously installed trim screws were located and the headliner was cut to mark the location and remove them. Finished headliner with windshield and sun visors reinstalled. Other than a couple wrinkles, it didn't turn out bad. The sun visors were the original parchment ones that had been sprayed black. Trying to remove the paint was futile so I simply sprayed them parchment, which will do until I replace them.